Water Plague | Yobot Inc.
Not only has our basement flooded three times since we’ve moved in (and dear readers, for those of you who may have lost count, that’s three times in nine months, THREE TIMES in not even a year yet) but the water plague is following me to my place of employment, too. Last week, while working downtown in the loop at my job, we heard a terrible commotion in the hall. 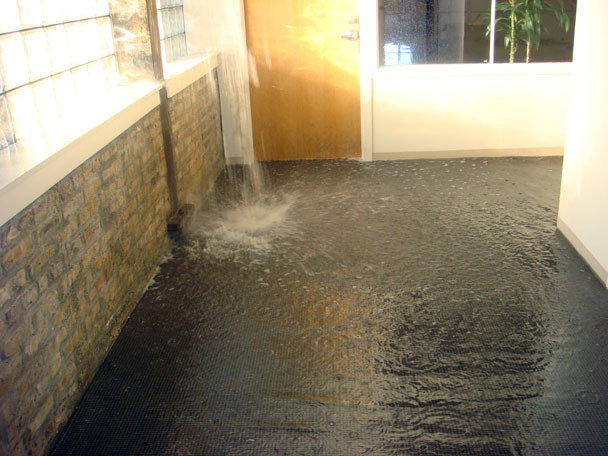 We looked down the hall, and saw some water dripping from the ceiling – we’re on the top floor of a 6 story building. Suddenly, the water turned into a veritable flood, like someone above us on the roof had turned on a fire hydrant. The water quickly began to fill the hall. Burst pipe! It was a frozen and burst pipe in the fire sprinkler system. We were very lucky where I work, because no water got into our office. Across the hall and all five floors below us, not so lucky. A lot of damage. The water even got down to the basement – it’s amazing how fast the water found it’s way downstairs. The fire department came and shut off the water – they said they’d been responding to frozen pipes all over the city. Anyway, water seems to be following me wherever I go. I need to do a non-rain dance or something.